Since Goldilocks has become synonymous with birthday parties, it was only a matter of time before the country's number one bakeshop built their own special place to have the ultimate Goldi-good celebration. For that reason, the Goldilocks Cake City (located in the company's Shaw Boulevard Headquarters) was recently completed to fulfill this objective. Whenever the special occasion or festivity may be, the Goldilocks Cake City can comfortably seat a party of fifty - with enough space left over for games, decorations, and installations. Given its ideal central location, ample size, fanciful decor, and ready access to delightful Goldilocks treats, the Goldilocks Cake City will surely make waves as the event venue of choice. 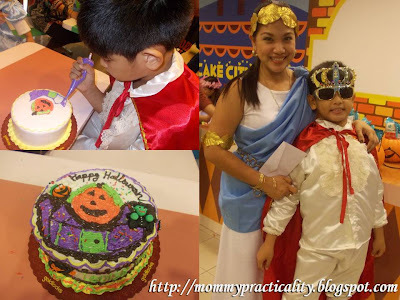 Selected bloggers from the foremost and most well-read sites, as well as popular digital publishers were invited to experience the Goldilocks Cake City firsthand with their children, and saw for themselves just how "hallo-wonderful" a Halloween party could be. It was a day filled with exciting and entertaining activities, including a variety of games and a decorate-your-cake (DYC) session. Special award were likewise given to the best costumes (individual and pair), and the most creative DYC creations. "Goldilocks is truly the one-stop celebration specialist," enthused Marketing Director, Pinky Yee. "From a full menu, to amazing cakes and pastries, to a theme that can't be beat, Goldilocks now provides a venue for you to enjoy all these and more with friends and family!" Is this his first time to decorate a cake? He is good. Nice costumes... You deserve to win! Congratulations again for winning the Best in Costume award! You were definitely the most beautiful goddess there. :D It was wonderful meeting you in person and hopefully, we'd bump into each other again in future events. Great Goldilocks sponsored event. Great costumes as well. Goldilocks has really wide variety of cakes. oh, that's exciting news to hear that that they now have their very own party place. You really deserve the award! Very nice costume! Love their cakes. Congrats for winning! wow congrats! goldilocks has captured our hearts. aside from cake, i love their polvoron and pastillas.